Sub-ohm tanks like the Aspire Atlantis have been getting a lot of attention lately, but not everyone vapes high-powered setups with low ohm coils. Widely considered one of the best clearomizers on the market, the Aspire Nautilus Mini is a trimmed down version of the original Nautilus with all of the same great features. 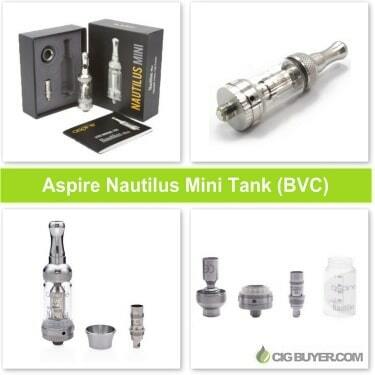 Instead of a 5ml tank, the Mini Nautilus has a smaller 2ml tank with the same “BVC” (Bottom Vertical Coil) technology and an adjustable airflow system which makes customizing the draw a snap. It’s super easy to maintain, and it performs exceptionally well.